Calling fashionistas to Zuri Bar & Dining. 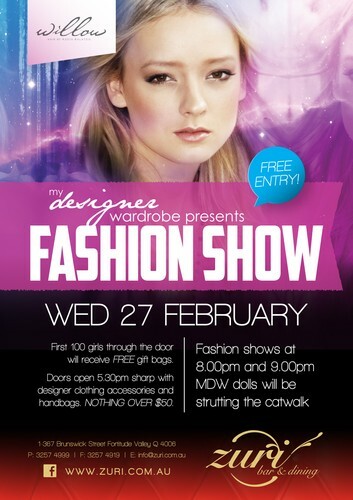 Featuring fashion, champagne and a reason to get dressed up, check out the My Designer Wardrobe Fashion Shows at Zuri Bar & Dining on Wednesday 27 February. You can also take home a piece from the My Designer Wardrobe pop-up stall from a range of designers and labels including Bariano, Cooper Street, Sunny Girl, Lumier, Reverse and Finders Keepers, all for $50 and under. This is the perfect excuse to catch up with your girlfriends for some mid-week fun and book a table for All You Can Eat Sushi. Sponsored by Willow Hair, the shows will be at 8pm and 9pm with the MDW dolls strutting the catwalk to live music by DJ Sparkles. The first 100 people through the door will receive a free gift bag filled with goodies from local Brisbane businesses. Bookings are essential – call 07 3257 4999 to secure your table for All You Can Eat Sushi and avoid disappointment.